This article is about an association football term. For other uses, see Playmaker (disambiguation). In association football, a playmaker is a player who controls the flow of the team's offensive play, and is often involved in passing moves which lead to goals, through their vision, technique, ball control, creativity, and passing ability. In English football, the term overlaps somewhat with an attacking midfielder, but the two types of midfielders are not necessarily the same, as playmakers are not necessarily constrained to a single position. Several playmakers can also operate on the wings, or as a creative, supporting striker; some can also function in a more central midfield role, alternating between playing in more offensive roles and participating in the build-up plays in the midfield. Other players still function as deep-lying playmakers, in a free role, behind the midfield line. Playmakers are not usually known for their defensive capabilities, which is why they are often supported by a defensive midfielder. As many midfielders and forwards have the aforementioned creative and technical attributes, they tend to be the playmakers of a team. Diego Maradona right before scoring the "Goal of the Century" for Argentina against England in Mexico 1986. The most complete and versatile playmakers are often known as advanced playmakers, or free-role playmakers, as they can operate both in central, attacking midfield positions, as well as in wider positions on the wings. The attacking playmakers are sometimes called the "number 10" of the team, as they often wear the number 10 jersey. The attacking midfield playmaker will sit in a free role between the midfield and the forwards, either in the centre of the pitch or on either flank. These offensive playmakers will often make incisive passes to the wingers or forwards, seeing them through on goal or to deliver killer crosses, as well as scoring goals themselves. They are also usually quick, agile, and highly technical players with good vision, shooting, passing, crossing and dribbling ability; they are known for scoring goals as well as providing assists, through-balls, and initiating attacking plays. In Italian football, as creative, technical, advanced playmakers are known not to be reserved to a single position, they are often described as the "fantasista" or "trequartista". In Brazil, the offensive playmaker is known as the "meia atacante", whereas in Argentina, it is known as the "enganche". In the English language, this position is sometimes colloquially referred to as playing "in the hole", as these playmakers often link the midfield and attack by essentially operating in the gap between the opposition's midfield and defence. Diego Maradona, Zico, Marta, and Francesco Totti are examples of advanced midfield playmakers. Deep-lying playmaker Andrea Pirlo playing for Italy against England in the quarter-finals of Euro 2012. Luka Modrić is known for his ability to blend advanced playmaking with deep-lying positioning. Deep-lying playmakers, who often wear jersey numbers 8, 6 or 5 (in particular in South American football), operate from a deep position, in or even behind the main midfield line in a seemingly central or defensive midfield role, where they can use space and time on the ball to dictate the tempo of their team's play and orchestrate the moves of the whole team, not just attacks on goal. Deep-lying playmakers are often known for their vision, technique and passing. Many are also known for their ability to switch the play or provide long passes that pick out players making attacking runs, as well as their striking ability from distance. Although several deep-lying playmakers are not known for their tackling, work-rate, or defensive skills, it has become more common for a box-to-box midfielder with good passing, technique, vision and ball-winning ability, such as Yaya Touré, to play in this role, since it is in a similar position to that of a defensive midfielder, and the role allows them to break down plays and subsequently create scoring opportunities themselves after winning back possession. In Italy, the deep-lying playmaker is known as a "regista", whereas in Brazil, it is known as a "meia-armador". Xavi, Andrea Pirlo, Luka Modrić, Michael Carrick, Paul Scholes, and Pep Guardiola are some examples of deep-lying playmakers. Playmakers are not necessarily constrained to a single position; many attacking playmakers in modern football play a combination of these different attacking roles, often operating in a free position. Some playmakers can also function in a more central midfield role, or even alternate between playing in more offensive creative roles and participating in the build-up plays and controlling the team's tempo in a deeper midfield position, such as Zinedine Zidane, Nécib, or Juan Román Riquelme. Creativity, skill, vision, technique, tactical awareness and good passing ability are the true requirements of a good playmaker. With the increasing physical and athletic demands of modern football, it has also become increasingly common for midfield playmakers, in particular those who are known for their dynamism, ability to read the game, and work-rate off the ball, to play in deeper roles and be given more defensive responsibilities, in addition to their creative duties: midfielders such as Bastian Schweinsteiger, Toni Kroos, and Paul Pogba often play in the centre of the pitch and occupy multiple roles, functioning both as box-to-box midfielders and creators, usually dropping back and helping to press opponents and win back possession, and then subsequently either carrying the ball forward, or dictating play and starting an attack with their vision, technique, and passing. According to Jonathan Wilson, Luka Modrić is another example of a midfielder who occupies multiple roles on the pitch; although he initially started out as an attacking midfielder at Dinamo Zagreb, he was moved into a deeper central midfield playmaking role during his time with Tottenham, which enambled him to conduct the attack and create chances for teammates. He continued to play in a deeper midfield role in Real Madrid's 4–2–3–1 system. However, Wilson has noted that, although Modrić seemingly plays as a holding midfielder, he is "neither entirely destructive or creative", but a "carrier" who is "capable of making late runs or carrying the ball at his feet", but in his case "with a hint of regista". Ronaldinho – pictured with Brazil at the 2008 Summer Olympics – occasionally played as an inverted winger throughout his career. Advanced playmakers can also operate on the wings, in more of a wide position, as a half-winger, inverted winger, or also as an outside forward, in a 4–3–3 or a 4–2–3–1 formation. This position has become more common for offensive playmakers to carry out in recent years, as formations that employ a purely attacking playmaker, such as the 4–3–1–2/4–1–2–1–2, can often cause teams defensive problems when possession is lost, as attacking midfielders are not usually renowned for their defensive contribution, although modern playmakers are often more tactically responsible in this respect than classical playmakers. This position also allows players to take on defenders in one on one situations along the flank, cut inside to the centre of the pitch with the ball, and either shoot on goal with their stronger foot, or provide in-swinging lobbed passes or crosses. Lionel Messi, for example, was initially deployed in this position under manager Frank Rijkaard, along with Ronaldinho. Some playmakers, such as David Beckham, even operate as a wide midfielder in a 4–4–2, using their vision to find teammates making runs, to whom they can then deliver long passes and curling crosses, although this position of a "pure winger" has become less common in modern formations. Michel Platini – depicted holding aloft the Ballon d'Or in Juventus colours – coined the term "nine and a half". There are also other similar variants upon the advanced playmaking role. Other advanced playmakers seemingly operate as a free, creative second striker, or inside-forward, often playing on the wing, alongside a main striker, or even down the centre of the pitch, and then falling back into a deeper role to link up the midfield and the attack. Attacking midfielder/playmaker Michel Platini would describe this more advanced creative role (exemplified by Roberto Baggio) as a nine and a half ("nove e mezzo" in Italian), as it was halfway between the role of a goalscoring forward (shirt number 9) and a playmaking attacking midfielder (shirt number 10). This position allowed these technical players to make dribbling runs, and score many goals as well as assisting them. Unlike a pure number ten playmaker, however, the nine and a half/supporting forward does not usually participate in the build-up play as much as an attacking midfielder would. Their role is primarily that of an assist-provider, who can play one-twos as well as hold up and lay-off the ball for more offensive teammates; as the supporting forward initially originated from free-role attacking midfielders adapting to a more advanced position in the tactically rigorous 4–4–2 formations of the 1990s, their defensive contribution is also usually higher than that of a pure number ten playmaker. In Italy, this role is known as a "rifinitore" or "seconda punta", whereas in Brazil, it is known as a "segundo atacante" or "ponta-de-lança". Lionel Messi has been a leading exponent of the false 9 position. A variation upon the deep-lying forward, more commonly known as a "false 9" also shares some similarities with the attacking midfielder role, although the false-9 player appears to be playing as a centre forward rather than as an attacking midfielder. A false-9 is often a quick, creative, technical player, with good vision, positioning and passing ability, with a penchant for scoring goals. The false-9, seemingly playing as a lone striker, will drop deep into the midfield number 10 role, drawing defenders with them, and creating space for other teammates to make attacking runs. This allows the false-9 space to dribble with the ball and score, or to provide these players with assists. Examples of false-9s are Lionel Messi under Pep Guardiola, Tito Vilanova and Gerardo Martino at Barcelona, Cesc Fàbregas with Spain under Vicente del Bosque, and Francesco Totti at Roma under Luciano Spalletti and Rudi Garcia. This position is most common in a 4–6–0 formation disguised as a 4–3–3 or 4–2–3–1 formation. Wesley Sneijder – pictured playing for Inter Milan in 2010 – has been deployed as a false 10 on occasion. The false 10 (sometimes described as a "central winger") also shares similar attributes to a false-9, and is often used in a 4–2–3–1 formation. A false-10 is also usually a quick, offensive, technical and creative player, who is apparently playing in deeper role than a false-9 however, usually starting in the attacking midfielder position behind the striker, or occasionally as a winger, as the role is often interpreted by players who naturally play in these positions. The false-10 will often surprise defenders by moving out of position, drifting out wide, onto the wing, creating space for other players, in particular the full-backs and midfielders, to make attacking runs, either by overloading the flanks, or by drawing opponents out of position. The false 10 will then advance along the flank and provide deliveries into the box for teammates, or pass the ball to a free teammate who is exploiting the newly created space, either on the wing or in the centre. The false-10 can also function alongside a false-9 on occasion, in a 4–3–3 (4–6–0) formation, or in a 4–2–3–1 formation. When other forwards or false-9s draw defenders away from the false-10s, creating space in the middle of the pitch, the false-10 will then also surprise defenders by moving out of position once again, often undertaking offensive dribbling runs forward, or running on to passes from false-9s, leading to goals and assists. This role was effectively demonstrated by Wesley Sneijder and Mesut Özil during the 2010 FIFA World Cup. Leonardo Bonucci has often functioned as a ball-playing centre-back throughout his career. The false-10 (or false attacking midfielder) description has also been used in a slightly different manner in Italian football. The false attacking-midfielder is usually a technical and creative player with good vision, positioning, ball control and long passing ability, as well as being a player with respectable defensive attributes, and good long distance shooting ability. The false-10 performs in a similar manner to the false-9, although seemingly playing in the number 10 role, but still drawing opposition players back into the midfield. The false-10 will eventually sit in a central midfield role and function as a deep-lying playmaker, creating space for other players to make attacking runs and receive long passes from the midfield playmakers. It is also possible for a sweeper (or "libero", in Italian) to operate as a team's secondary playmaker; this position is often associated with former central defenders, such as Franz Beckenbauer, Franco Baresi, Ronald Koeman, Fernando Hierro, Aldair and Gaetano Scirea, who possessed good ball skills, vision, and long passing ability. Although this position has become largely obsolete in modern football formations, due to the use of zonal marking, players such as Daniele De Rossi, Jérôme Boateng, Leonardo Bonucci and David Luiz have played a similar role as a ball-playing centre-back in a three-man back-line. Their technique and ball-playing ability allow them to advance into midfield and function as a secondary playmaker for the team, in order to create goal-scoring chances when their team's primary deep-lying midfield playmaker is being heavily marked by the opposition. German goalkeeper Manuel Neuer is known for his distribution. To some limited extent, it is also possible for goalkeepers with good ball skills, vision, passing, long-throwing, and kicking ability to launch counter-attacks and create scoring opportunities; goalkeepers such as René Higuita, Fabien Barthez, Edwin van der Sar and most recently Manuel Neuer, and Ederson Moraes for example, among others, are known for their adeptness with the ball at their feet, and their long passing accuracy from goal kicks; their playing style has led several pundits to dub them as "sweeper-keepers" or playmakers. Brazilian playmaker Marta is known for her technical skills in addition to her ability to score goals and create chances for teammates. Nécib – pictured playing for France in a match against Austria in 2013 – has drawn praise in the media for her elegance on the ball, as well as her vision and passing ability. Perhaps the most important quality of a playmaker is the vision and ability to read the game, and to get into good positions making for effective reception and distribution of the ball. Intuition and creativity are other key elements of a playmaker's game, as they need to know where different players are at different times, without taking too long to dwell on the ball. A good playmaker possesses good ball control, balance, technical ability, and dribbling skills, and will often hold possession, allowing other team members to make attacking runs. The ostensible role of the playmaker is to then provide or facilitate the final pass which leads to a goal. In football terminology, this is often known as a killer ball or the final ball, and is officially recorded as an assist. Advanced playmakers are often known for their ability to score goals as well as their technical skills, passing, and chance creation ability. They are often – but not always – quick, agile, and mobile players, with good tactical intelligence; their movement off the ball is just as important as their movement on the ball, as they must create space for further attacking plays. Many playmakers are also free-kick, penalty, and dead-ball specialists, who are also capable of curling the ball into the box from set pieces, providing further deliveries for teammates, although this is not necessarily a trait that is required to be a playmaker. English midfielder Steven Gerrard – pictured playing for Liverpool during the 2006–07 season – has played in a number of midfield roles throughout his career, including that of a playmaker. Classical number 10 and deep-lying playmakers are not often renowned for their tackling or defensive capabilities, hence English commentators have often seen them as a luxury in a football team, but they retain their places due to their ability to change games. Because of this, it became common in the past for box-to-box midfielders with good vision, tackling, tactical intelligence, passing and technical ability to play in the playmaker role in England, as shown by various coaches employing players such as Paul Scholes, Steven Gerrard, Yaya Touré and Xabi Alonso in this position. In a 4–4–2 formation, a playmaker will usually play alongside a defensive midfield player to ensure that the team is not vulnerable to attack. With different formations, however, a team may play with multiple playmakers. Most English teams usually use only one playmaker to minimize defensive frailties and also because using more than one may inhibit each playmaker's playing style. The downside to this approach is that a team lacks the necessary creativity when faced with a defensive opponent. Some contemporary teams using formations such as 4–2–3–1, 4–4–1–1, 4–5–1, and 4–1–2–1–2/4–3–1–2, have multiple playmakers. Some examples of the few notable English players in this position are Paul Gascoigne and Glenn Hoddle, while most playmakers have tended to be foreigners in the Premier League. Spanish playmaker Xavi playing for Barcelona in 2012. During his highly successful spell as the head coach of Barcelona, Pep Guardiola was able to incorporate several skillful players with playmaker qualities into his team, such as Xavi, Andrés Iniesta, Sergio Busquets, Cesc Fàbregas and Lionel Messi, through the use of his personal variation on tiki-taka tactics, allowing the team to move the ball around, switch positions, create space by making attacking runs, and retain possession. His use of heavy pressing in his 4–3–3 formation gave each player defensive responsibilities when possession was lost. Guardiola also frequently deployed Messi in the false-9 role, which has particularly effective due to the frequency of attacking runs made by the Barcelona players, as well as their disciplined positioning, team-work, vision, technical and passing ability, which allowed Messi to create and score several goals. Vicente del Bosque also incorporated similar tactics (such as the use of tiki-taka, heavy pressing and the false-9 in a 4–3–3 or 4–6–0 formation) during his successful run of reaching three consecutive international finals as Spain's manager, between 2010 and 2013, winning the 2010 World Cup and UEFA Euro 2012. His tactics allowed several playmaking midfielders, such as Xabi Alonso, Xavi, Andrés Iniesta, David Silva, Juan Mata and Cesc Fàbregas, to function together effectively. Carlo Mazzone and Carlo Ancelotti were known for having been able to adopt their formations to allow them to implement various playmakers into their starting formation. At Brescia, Mazzone moved Andrea Pirlo, originally an attacking midfielder, into the deep-lying role behind the midfield, whilst Roberto Baggio played the attacking midfielder role. For Milan, Ancelotti made a similar move, also employing Pirlo as a deep-lying playmaker, allowing Rivaldo or Rui Costa, and later Kaká, to play as an attacking midfielder, whilst Clarence Seedorf and either Gennaro Gattuso or Massimo Ambrosini protected them defensively in Ancelotti's 4–4–2 midfield diamond formation. Due to the strength of Milan's midfield during his tenure with the club, Ancelotti was able to win several domestic and international titles. Marcello Lippi also utilised two playmakers during Italy's victorious 2006 FIFA World Cup campaign, fielding Francesco Totti in the advanced creative role behind the forwards, and Pirlo in the deep-lying playmaking role. The two playmakers were supported defensively by box-to-box midfielders, such as Daniele De Rossi, Gennaro Gattuso and Simone Perrotta; both Pirlo and Totti finished as two of the joint top-assist providers of the tournament. Roma captain and attacking midfield playmaker Francesco Totti. Former Italy manager Ferruccio Valcareggi, however, devised a different strategy altogether, which allowed him to use two playmakers during his run to the 1970 World Cup final, where Italy would be heavily defeated by Brazil, however. Due to his focus on defensive stability, as well as the presence of two pure, prolific goalscoring strikers, Luigi Riva and Roberto Boninsegna, Valcareggi felt that it would not be possible to field Italy's two most revered advanced playmakers at the time, Gianni Rivera, and Sandro Mazzola, alongside each other. He believed the two creative players to be incompatible with each other, due to the rivalry between their respective clubs, and as he felt that deploying both players alongside the forwards would offset the balance within the starting line-up, in particular as Rivera, unlike Mazzola, was not renowned for his athleticism or defensive work-rate. He therefore conceived the infamous "staffetta" (relay) game-plan, which essentially consisted of Mazzola playing the first half of each match, whilst Rivera would play the second half; during Valcareggi's eight-year tenure with Italy, the national side only lost six matches. Despite Italy's victory at UEFA Euro 1968 and their second-place finish at the 1970 World Cup, the tactic was widely criticised by the media, in particular due to Italy's negative performance during the group-stage and in the final, despite demonstrating their ability to successfully apply a more offensive, exciting style of play with Rivera in the semi-final against West Germany. During the 1998 World Cup, Italy manager Cesare Maldini underwent similar widespread media criticism for employing a strategy reminiscent of the 1970 "staffetta" between Roberto Baggio and Alessandro Del Piero; manager Giovanni Trapattoni was also initially criticised for not fielding Francesco Totti and Del Piero alongside each other during the 2002 World Cup. Sandro Mazzola playing for Italy alongside Gianni Rivera; the two playmakers would be involved in manager Ferruccio Valcareggi's infamous staffetta policy at the 1970 World Cup. During his run to the Euro 2012 final and the 2013 FIFA Confederations Cup semi-finals, the former Italy coach Cesare Prandelli also used several playmakers in his squad; he often deployed either Riccardo Montolivo, Alberto Aquilani, Daniele De Rossi, Antonio Nocerino or Thiago Motta in the false 10 playmaking role, as well as in other midfield positions, in his 4–3–1–2 formation; this formation was devoid of an authentic attacking midfielder, and was centred on the midfielders constantly switching positions. Prandelli's midfield was focussed on the creative playmaking of Andrea Pirlo and Montolivo in their deep-lying playmaker and false attacking midfield roles, with Pirlo seemingly being deployed as a defensive midfielder in front of the defense, in order to be left with more time on the ball, in an "inverted" midfield diamond (4–1–3–2). Pirlo was supported defensively by dynamic box-to-box midfielders, such as Claudio Marchisio and De Rossi, due to his lack of pace or notable defensive ability. The space created by the movement of Montolivo as the false 10 allowed quicker, more offensive minded midfielders, such as Marchisio, to make attacking runs in order to receive Pirlo and Montolivo's long passes from the midfield, whilst the second striker Antonio Cassano would drop out wide onto the wing or into the attacking midfielder position to link up the play between the attack and midfield. As well as functioning as a playmaker, and creating space, in the false 10 role, Montolivo was also able to alleviate the pressure placed upon Pirlo in the deep lying playmaker role, by supporting him defensively and providing Pirlo and the team with a secondary creative option. Although Helenio Herrera's famous catenaccio tactics during the years of "La Grande Inter" in the 1960s were primarily thought to be associated with defensive yet effective football, creative playmakers played a fundamental part in Inter Milan's success during this period. Herrera and former Grande Inter players, including Mazzola and Facchetti, would state that they felt the Grande Inter side to be more offensive than it was often made out to be, and that imitators of Herrera's catenaccio tactics had often replicated his pragmatic style of football imperfectly. Luis Suárez (formerly an offensive playmaker who had first flourished under Herrera's more fluid, offensive tactics at Barcelona) was the primary creative force of Herrera's Inter side, functioning as a deep-lying playmaker, due to his ball skills, vision and passing range. Sandro Mazzola, in the role of a winger, attacking midfielder, inside-right or supporting striker, and Armando Picchi in the Libero or sweeper position, would also function as secondary playmakers at times, as well as left-winger Mario Corso. Aside from the strength of the almost impenetrable defence, some of the key elements of Herrera's Inter side were the use of vertical football and very quick, efficient and spectacular counter-attacks, which would lead to goals being scored with very few touches and passes. This was made possible due to Herrera's use of very quick, energetic, offensive, two-way full-backs to launch counter-attacks, such as Giacinto Facchetti, and Tarcisio Burgnich. Spanish midfielder Luis Suárez was the main playmaker of the Grande Inter side of the 1960s under manager Helenio Herrera. The quick, energetic technical wingers (Jair da Costa and Mario Corso) and offensive midfielder/supporting striker (Mazzola), would also occasionally move into deeper positions to support the midfield creatively and defensively, leaving the fullbacks with space to attack, which frequently caught the opposing teams by surprise. In Herrera's flexible 5–3–2 formation at Inter, four man-marking defenders were tightly assigned to each opposing attacker while an extra sweeper would recover loose balls and double mark when necessary. Under Herrera, most frequently during away matches in Europe, the highly organised and disciplined Inter players would usually defend by sitting patiently behind the ball, often leading to very closely contested victories. Upon winning back possession, Picchi, usually a traditional and defensive minded sweeper, would often advance into the midfield, and occasionally play long balls to the forwards, or, more frequently, carry the ball and play it towards Luis Suárez, whose playmaking ability played a crucial role in Inter's adeptness at counter-attacking football. Due to Suárez's outstanding vision and passing ability, he could quickly launch the forwards or full-backs on counter-attacks with quick long passes once he had received the ball, usually allowing the fullbacks to advance towards goal and score, or to help create goal-scoring chances. Under Herrera, Inter won three Serie A titles (two of them won consecutively), two consecutive European Cups and two consecutive Intercontinental Cups, and he was given the nickname "Il Mago" due to his success and tactical prowess. ^ "Playmaker – Define Playmaker at Dictionary.com". Dictionary.com. ^ a b c "The Fantasista". Fantasista10.co.uk. Retrieved 20 August 2014. ^ a b "Tactics: the changing role of the playmaker". World Soccer. Retrieved 5 January 2015. ^ Felix Keith (22 October 2014). "Why Playmakers Are the Premier League's Most Prized Assets". Bleacher Report. Retrieved 8 December 2018. ^ Ben Welch. "Link midfield and attack with a striker in the hole". FourFourTwo. Retrieved 8 December 2018. ^ a b c d Mancini, Roberto. "THE NUMBER 10". Retrieved 8 December 2018. ^ Ashish Shetty (19 April 2014). "Understanding a Regista's role in football". SportsKeeda.com. Retrieved 15 August 2016. ^ a b Amit Singh (4 June 2012). "Xavi, Pirlo, Carrick, Modric... A Tactical And Statistical Analysis of Deep-Lying Playmakers in 2011-12". Just-Football.com. Retrieved 15 August 2016. ^ "Generation Next: Matias Kranevitter amound five young argentine number 5s set to star in 2015". Just-Football.com. 4 January 2015. Retrieved 15 August 2016. ^ "The Regista And the Evolution Of The Playmaker". Football-Analysis.com. Retrieved 5 January 2015. ^ Cox, Michael (19 March 2012). "Paul Scholes, Xavi and Andrea Pirlo revive the deep-lying playmaker". The Guardian. London. Retrieved 29 June 2012. ^ "The resurgence of the deep-lying playmaker". The False 9. Retrieved 29 June 2012. ^ a b "The modern role of the playmaker". FIFA.com. 1 August 2014. Retrieved 4 October 2017. ^ Ciaran Kelly (7 December 2011). "Zinedine Zidane: The Flawed Genius". Back Page Football. Retrieved 6 July 2015. 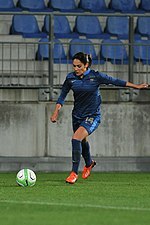 ^ "More to come from Louisa Necib". Canadian Broadcasting Corporation (in French). 14 July 2011. Retrieved 11 September 2011. ^ Jason Cowley (18 June 2006). "Lonesome Riquelme is the go-to man". The Guardian. Retrieved 16 March 2019. ^ Ebrahim Sadien (5 July 2013). "The Regista And the Evolution Of The Playmaker". Football Analysis. Retrieved 6 July 2015. ^ Davie, Chris (20 June 2011). "How Luka Modric's Contribution Makes him Tottenham's Irreplaceable Asset". WhoScored.com. Retrieved 14 July 2017. ^ Wilson, Jonathan (18 December 2013). "The Question: what does the changing role of holding midfielders tell us?". The Guardian. Retrieved 15 July 2017. ^ "How the 2000s changed tactics #2: Classic Number 10s struggle". Zonalmarking.net. Retrieved 5 January 2015. ^ "Lionel Messi". Retrieved 5 January 2015. ^ "David Beckham, Great Britain". ESPN.co.uk. Retrieved 7 July 2015. ^ Colman Corrigan. "The decline of the old-fashioned winger". givemesport.com. Retrieved 6 July 2015. ^ a b "Platini: Baggio, Il Fu Nove E Mezzo" (in Italian). Archived from the original on 2013-06-04. Retrieved 2012-06-16. ^ "The Greatest Second Strikers / Inside Forwards of All Time". Archived from the original on 6 February 2015. Retrieved 5 January 2015. ^ "Barcelona's False-9". The False 9. Retrieved 2012-06-15. ^ "Was Guardiola trying to replicate Roma's resplendent 2007 striker-less formation under Luciano Spalletti?". Theirtactics.com. Retrieved 2012-06-15. ^ a b c "The False-10". Tomwfootball.com. Retrieved 2012-06-16. ^ "Introducing…the central winger?". Zonalmarking.net. Retrieved 4 January 2015. ^ a b James Horncastle. "Horncastle: Riccardo Montolivo straddles both sides of the Germany/Italy divide". The Score. Archived from the original on 20 August 2014. Retrieved 20 August 2014. ^ "Remembering Scirea, Juve's sweeper supreme". FIFA.com. Retrieved 5 January 2015. ^ "Franz Beckenbauer Biography". Retrieved 5 January 2015. ^ "BBC Football – Positions guide: Sweeper". BBC. Retrieved 5 January 2015. ^ "Franchino (detto Franco) BARESI (II)". Retrieved 5 January 2015. ^ Rzouki, Mina (4 August 2018). "Juventus swapping Mattia Caldara for Leonardo Bonucci makes sense". ESPN FC. Retrieved 22 February 2019. ^ a b "Daniele De Rossi and the strange story of the Libero". Forzaitalianfootball.com. Retrieved 5 January 2015. ^ Miguel Delaney (15 April 2017). "Antonio Conte saw reinventing David Luiz and overcoming Chelsea criticism as 'great challenge'". The Independent. Retrieved 21 May 2017. ^ Liam Twomey (15 April 2017). "Chelsea never doubted David Luiz's quality as top defender – Antonio Conte". ESPN FC. Retrieved 21 May 2017. ^ "L'ANGOLO TATTICO di Juventus-Lazio – Due gol subiti su due lanci di Bonucci: il simbolo di una notte da horror" (in Italian). Retrieved 5 January 2015. ^ Baldi, Ryan (11 January 2017). "Why 3-defender systems exploded in popularity across the soccer world this season". www.sbnation.com. Retrieved 22 February 2019. ^ "Soccer positions explained: names, numbers and what they do". www.bundesliga.com. Retrieved 22 February 2019. ^ "Manuel Neuer and the evolution of the goalkeeper". FourFourTwo. Retrieved 9 January 2015. ^ "Why Manuel Neuer should not win the Ballon d'Or". The Score. Retrieved 9 January 2015. ^ Luke Brown (6 April 2018). "How Ederson redefined what is expected of a Goalkeeper". The Independent. Retrieved 6 April 2018. ^ Paul Wilson (28 January 2001). "Barthez, the best buy". The Guardian. Retrieved 13 January 2018. ^ "FM-Tactics – Brought to you by Football Manager Britain". Fm-tactics.co.uk. Retrieved 20 August 2018. ^ "Why have England traditionally feared the fantasista?". Thesefootballtimes.co. 18 June 2018. Retrieved 20 August 2018. ^ "Brian Glanville on the dearth of English playmakers – World Soccer". Worldsoccer.com. 6 September 2011. Retrieved 20 August 2018. ^ "The relationship between age and the regista". Thesefootballtimes.co. 19 April 2015. Retrieved 20 August 2018. ^ "Are Midfield Plungers the New Play-makers?". Theirtactics.com. Retrieved 15 May 2012. ^ "Cox: Lack of deep-lying playmakers in Prem". Espn.co.uk. Retrieved 22 August 2018. ^ "English football must stop outsourcing creativity if the national team is to succeed". Financial Times. Retrieved 20 August 2018. ^ Wilson, Jonathan (18 August 2010). "The Question: What is a playmaker's role in the modern game? – Jonathan Wilson". the Guardian. Retrieved 20 August 2018. ^ "The Achilles heel of English football". Economist.com. Retrieved 20 August 2018. ^ "Where are all of the British Deep-Lying Playmakers?". FootballFanCast.com. 2 April 2012. Retrieved 20 August 2018. ^ "English Premier League focusing on developing a new generation of playmakers". Nationalpost.com. 11 August 2013. Retrieved 20 August 2018. ^ "Comparing Marcelo Bielsa to Pep Guardiola". Theirtactics.com. Retrieved 15 May 2012. ^ "Complete Guide to the False 9 and Who Plays It Best". Bleacher Report. Retrieved 20 August 2014. ^ "Spain vs. Italy: Analyzing the 'False Nine' and 3-Man Central Defence". Bleacher Report. Retrieved 20 August 2014. ^ "Two years into the Mourinho project and a league trophy to show- Where does Madrid go from here?". Theirtactics.com. Retrieved 15 May 2012. ^ "Italia 2006: campioni del mondo. Grosso jolly, Cannavaro e Buffon muro: voto simpatia 7,5". Retrieved 13 January 2015. ^ "Totti fails the final test and leaves a tattered international reputation". The Guardian. Retrieved 13 January 2015. ^ "L'Italia è Campione del mondo Francia ko dopo i calci di rigore". La Repubblica (in Italian). Retrieved 13 January 2015. ^ "Andrea Pirlo: Where Does He Rank Among the Best Italian Midfielders Ever?". Bleacher Report. Retrieved 13 January 2015. ^ "Messico 70 e quei sei minuti di Rivera". Storie di Calcio (in Italian). Retrieved 13 January 2015. ^ "Maldini sceglie Baggio, ma Alex vuole il posto". La Repubblica (in Italian). Retrieved 13 January 2015. ^ "I dubbi del Trap Del Piero-Totti insieme?". Panorama (in Italian). Retrieved 13 January 2015. ^ Fox, Norman (11 November 1997). "Obituary: Helenio Herrera". The Independent. UK. Retrieved 22 April 2011. ^ "Mazzola: Inter is my second family". FIFA.com. Retrieved 11 September 2014. ^ "Great Team Tactics: Breaking Down Helenio Herrera's 'La Grande Inter'". Bleacher Report. Retrieved 10 September 2014. ^ a b c "Helenio Herrera: More than just catenaccio". FIFA.com. Retrieved 10 September 2014. ^ "La Grande Inter: Helenio Herrera (1910-1997) – "Il Mago"". Sempre Inter (in Italian). Retrieved 10 September 2014. ^ "La leggenda della Grande Inter" [The legend of the Grande Inter]. Inter.it (in Italian). Archived from the original on 19 October 2012. Retrieved 10 September 2014.